Robert Riversong describes below the how his version of the Larsen Truss evolved through several home construction projects. 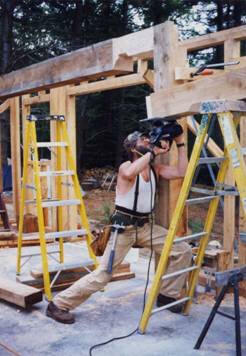 He provides much useful construction detail for the truss, and for other sustainable building and living practices. Thanks again to Robert for providing material on this very well thought out design. 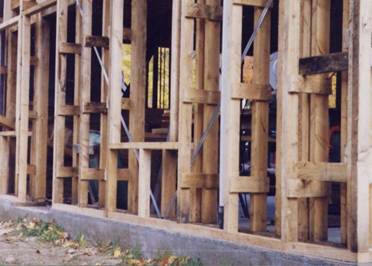 John Larsen of Canada invented a simple parallel-chord wooden truss as a method for superinsulating existing houses. The idea was to strip off old siding and cut off existing roof overhangs, nail trusses onto the walls and over the roof, creating a new overhang. Then new sheathing, siding and roofing could be applied, and perhaps new windows. Alternatively, the existing windows could be left in place and extended exterior window boxes and sills created. This would turn an old, drafty house into a superinsulated home without any disturbance to the living space (unless windows were replaced). The truss cavity could then be filled with blown insulation. 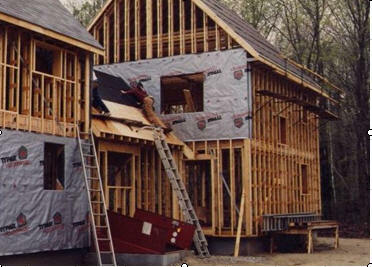 Additionally, a vapor barrier could be applied over the existing wall sheathing before installation of trusses without fear of condensation as long as 2/3 of the R-value of the envelope is outside of the barrier. I learned about this wall system when I studied energy-efficient building at Cornerstones School in Brunswick Maine in 1982. 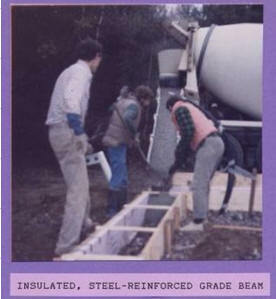 The school was spun off from the nation’s first owner-builder school, Shelter Institute, and founded by engineer Charlie Wing (author of From the Ground Up, From the Walls In, and the recent Visual Handbook of Building and Remodeling). The lead instructor was Dale McCormick (author of Against the Grain: A Carpentry Manual for Women) and the one of the first women to become a union carpenter. 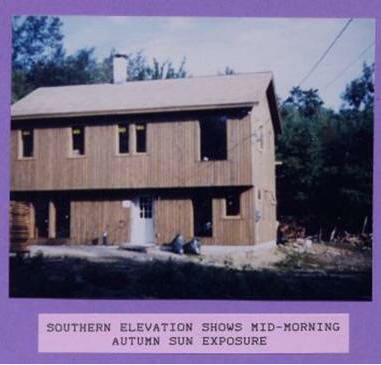 I also read about it in Don Booth’s seminal book Sun/Earth Buffering and Superinsulation. But, before I used the Larsen Truss approach, I experimented with a variety of double stud wall systems, each of them problematic for a variety of reasons. When I was asked to build a low-cost home and pottery studio for a wonderful couple who had been saving for 14 years, I decided to try the Larsen Truss. 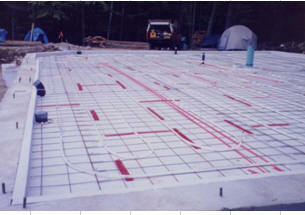 This house was built on a foam-insulated reinforced concrete grade beam on a rubble-trench foundation, with an insulated flagstone on sand bed first floor. 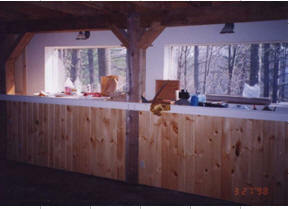 All the framing was green rough-sawn lumber custom milled to full dimension. The load bearing walls were 2x6 for the first floor and 2x4 for the second, set on PT plywood subsills on recycled tin printing plates for insect barrier. 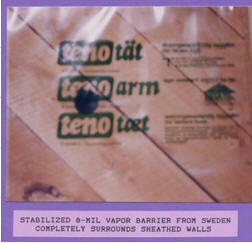 The exterior walls were sheathed with rough-sawn diagonal boards and then wrapped with 8 mil stabilized Swedish Tenoarm vapor barrier, installed like housewrap with one taped seam. 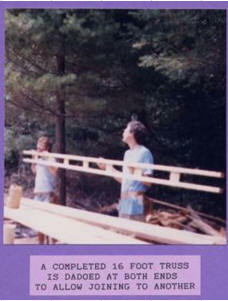 The trusses were fabricated by ripping KD 2x4s, dadoing 3/8” slots 24” oc, and glue-nailing plywood gussets into the slots. They were a standard 16’ in length with dadoes at each end for splicing to another truss section. The prefabbed trusses were then nailed to rafter tails, through the sheathing to 24” oc studs, and extended to sit on a bottom plate on the plywood subsill. Because the owners wanted vertical siding, we nailed horizontal 2x2s 24” oc and then wrapped Typar over the cross-hatched exoskeleton. Pre-stained shiplap siding was installed over all. The system was a bit labor-intensive, but there was only one other paid carpenter and the homeowners comprised the rest of the crew. 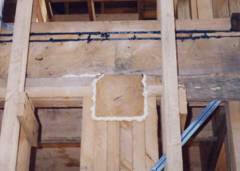 The primary drawback of the system was that we were left with two insulation cavities. I wanted to use blown cellulose, but to get in into the truss cavity now that it was sided we had to use a holesaw to cut through the inner sheathing and the vapor barrier. I used the Tenoseal adhesive which came with the Tenoarm to seal the holes with plastic patches after the insulation was installed. But, since I didn’t feel like renting the cellulose blower again and making holes in the drywall, I decided to insulate the inner wall cavities with unfaced fiberglass. Because this was my first attempt at blowing cellulose and I had access only to a rental blower of questionable quality, I was concerned about potential settling under the deep plywood window boxes. So, since I had fiberglass on site, I stuffed an R-19 unfaced batt under each window box so that it would be compressed by the dense-pack cellulose and re-expand if there were to be any settling. The house was certainly a success, operating as designed to require only 4/5 of a chord of wood per year to heat. It used the small Yotul woodstove as the exhaust system and relied on passive make-up air inlets, some of them site-built to take in air under the south garrison overhang and duct it both to the downstairs ceiling and through the upstairs floor. 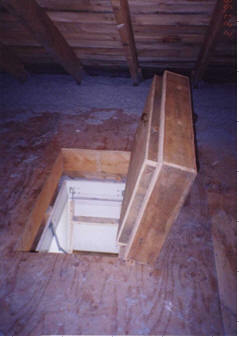 The woodstove also had a subfloor combustion air inlet that terminated at a floor register near the hearth. 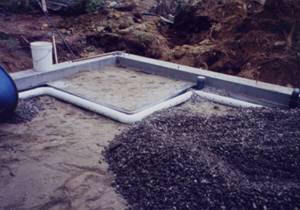 And a radon vent went from under the slab to above the roof. 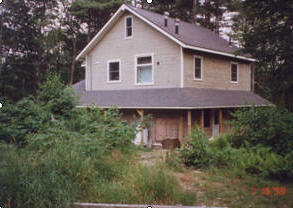 The 1400 square foot studio/house was completed in 1987 for $48,000 including site work, well and septic. It won a Citation of Excellence from a national Energy & Resource-Efficient Design Competition sponsored by the Northeast Sustainable Energy Association. My next opportunity to use the Larsen Truss was in 1993, when I volunteered to chair the design committee for a community-based non-profit building project called Building Our Swords Into Plowshares, which was the Gandhian “constructive project” of the 18-month long War Tax protest in Colrain Massachusetts following the IRS seizure and auction of a home. 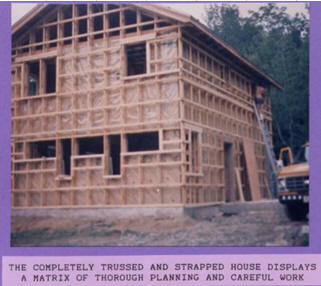 With the help of architect Bruce Coldham, I eliminated the problems of my first experience by creating a “modified” Larsen Truss, using the load-bearing studs as the inner chord of the truss. 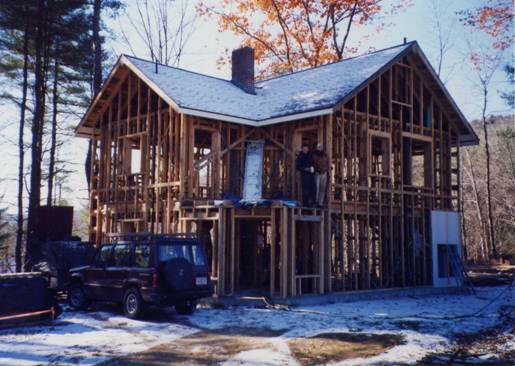 By installing metal T-bracing in the frame for rack bracing, we eliminated the need for sheathing, used less lumber and created a single insulation cavity to be filled with dense-pack cellulose. 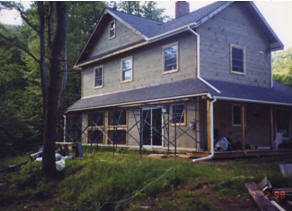 We also used horizontal novelty drop siding so that additional nailers were unnecessary. 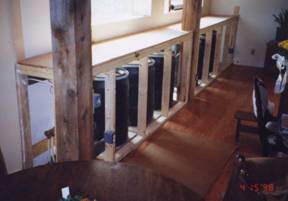 This proved to be a simpler, more resource-efficient, and easier-to-insulate wall system. Instead of vapor barrier, we employed the Air-Tight Drywall Approach (ADA), which involved caulking each framing layer to the next at the perimeter with Tremco acoustical sealant, and applying the same sealant to top and bottom plates as drywall went up. 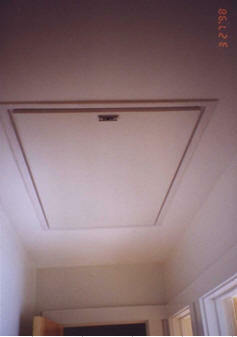 Polypans were also used around electric boxes, whose wide flanges offered a caulking surface for the drywall membrane. 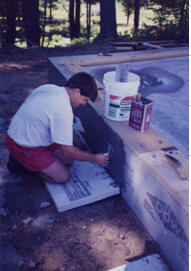 This was actually less work than installing a continuous vapor barrier. To make the inspector happy, we used Glidden vapor retarder primer (no longer available, but Sherwin Williams makes one). The Plowshares duplex was completed with the help of 300 community volunteers, and eventually was transferred to Pioneer Valley Habitat for Humanity along with an extra lot on which they built another single-family home. Frame is KD 2x4 and trusses are 2x4s ripped into 2x2s with plywood gussets. The next time I had an opportunity to design and build a superinsulated house was for some dear friends of mine I had known at the Noonday Farm Catholic Worker community in north central Massachusetts. 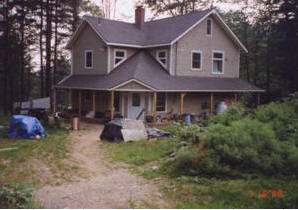 This would be a 1440 square foot, 3-bedroom home overlooking an organic farm field. Initially, they had considered an earth-bermed house with concrete walls tucked into a south-facing slope. But when they realized they could have a highly energy-efficient passive solar home with views of their farm field, good daylighting and ventilation, they were happy to shift gears and scrap the plans drawn up for them by an engineer friend who had designed America’s first Peace Pagoda for the Nipponzan Myohoji Buddhist order. 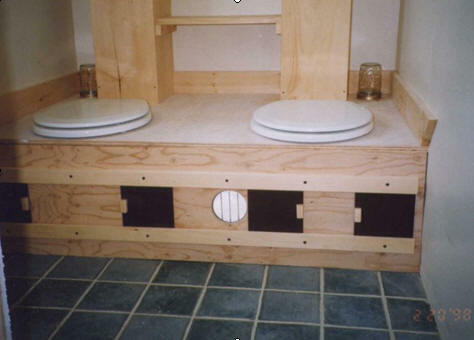 So we spent the winter designing and planning a modified Larsen Truss home which was to include a solar-heated indoor planting bed, wood heat and cookstove, provision for heating hot water with a coil in the cookstove, and Massachusett’s first approved site-built composting toilet. 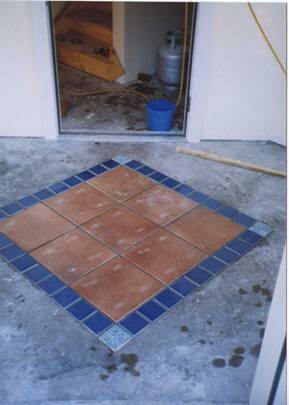 It was also built to the Energy Crafted Home program which offered incentives for efficiency. Because the homeowners wanted to store solar heat for their planting bed in six 50-gallon black plastic barrels behind south-facing glazing, I suggested that we install radiant tubing in the slab with a circulator and aquastat so that, if there were enough temperature rise, excess solar heat could be stored in the floor. As I suspected, however, there was too little surface area to volume ratio in the barrels to get the water hot enough for efficient heat exchange. 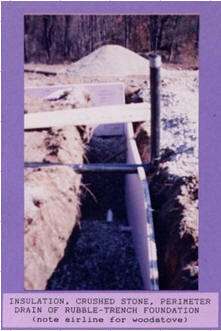 The slab was poured inside a shallow, frost-protected grade beam and on top of radon mitigation piping. The frame was a hybrid stick and timber frame, with exposed interior load-bearing timber bents using a simplified pegged joinery system that I designed. The house was built entirely of local rough-sawn hemlock, including subfloors and roof sheathing, and the siding and trim was planed local hemlock prestained in a dipping bath. The interior load-bearing 2x4 frame was braced with let-in steel T-bracing, and the outer truss members were 2x3 with 1x4 gussets to tie them to the structural studs. 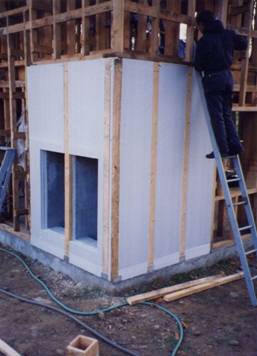 The air-tight drywall system was used to make the envelope impervious to infiltration and to avoid the need for a vapor barrier. 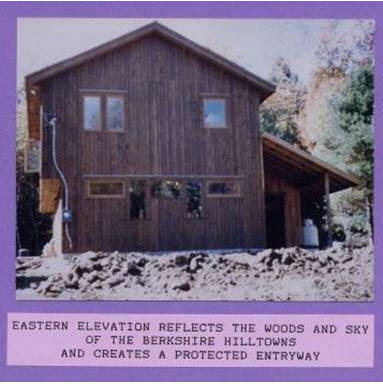 The house cost a little more than $100,000 (about $75/sf) to build in 1998, and was designed to require 4/5 of a chord of firewood per year for heat, in addition to passive solar gain. Indoor ventilation is provided by passive fresh-air inlets, with bath and kitchen fans as well as woodstove and wood cookstove serving as exhaust fans. 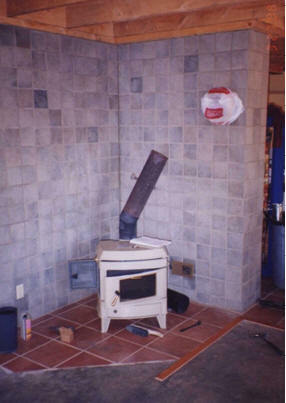 The woodstove has a nearby combustion air inlet register in the base of the chimney. The compost toilet has been supplying clean loam for ten years.